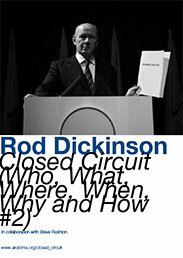 A version of this text was first published as part of a series on how media master reality in The First/Last Newspaper, edited by Dexter Sinister (November 2009). 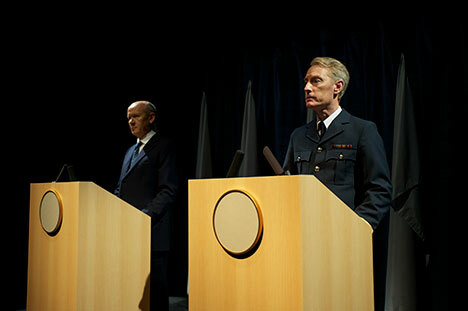 You know the script: A politician and a military spokesperson mount the stage; each takes their place behind a podium. They face the ladies and gentlemen of the press and a bank of TV cameras. A line of flags provides an appropriate backdrop as the politician begins to speak. The politician reminds us of the necessity of the action they have taken. The politician reminds us that we did not want war, in fact we did everything in our power to prevent conflict, but if an aggressor wilfully turns aside all overtures for a peaceful resolution, and if the aggressor continues to threaten the fundamental values of our society, then there is no choice. The military spokesperson now points to a screen that demonstrates the efficiency of the weaponry our forces have employed against the aggressor. It also displays evidence of the military capacity of the aggressor. It seems that if they were afforded the opportunity they could inflict terrible harm on our forces, and to the way of life many have died to preserve. But the press briefing is more than just a script; you also need the stage, the podium, the uniforms, the flags, the press and the cameras if you really want to master reality. By ‘mastering reality’ I mean that there are certain media events that simply through their performance can have an effect in the world. Maybe you remember back in 2003, when a military man mounted the stage and provided evidence of Weapon’s of Mass Destruction. What surprised many about the outcome of this performancewas the comparative ease with which it was exercised, and how a war could be prosecuted despite any real ‘evidence’ being produced that could suggest that such weapons did exist. It was as if the whole machinery of the press briefing was a feedback loop, which justified military action but also legitimised the press briefing itself. For those of us raised with the notion that the press and TV news exist to somehow ‘get to the bottom’ of things, and that the news media are a forum in which things can be proven or disproved, the ease with which transparent nonsense became a matter of fact that could justify fatal action came as a shock. Whatever this thing we call ‘the news media’ is, it is not in its nature to simply test matters of fact. The WMD incident demonstrated that the apparatus of the media actually has the ability to produce facts. The press briefing demonstrates two fundamental things about the structure of contemporary media: 1) It is a feedback loop that gives legitimacy and a narrative to those who produce it, 2) The incantation that ‘produced’ WMD reminds us of the most valuable lesson the French philosopher Michel Foucault taught us – discourse produces its object. I’d like to travel back to the beginning of the video revolution and reflect on two media events produced by the collaborative art and design group Ant Farm in 1975, Media Burn – in which a customised Cadillac was driven through a pyramid of blazing television sets – and The Eternal Frame (with T.R. Uthco) – a re-enactment of the assassination of John F. Kennedy. The twenty-two seconds of home-movie footage of the Kennedy assassination, taken in Dallas in 1963 by bystander Abraham Zapruder, were sold to Life Magazine on the night of the shooting for $150,000. Life published stills from the filmshortly afterwards. Later, the Zapruder family would be paid 10 million dollars by the US government for rights to the film. The Warren Commission used the film as the basis for a series of reconstructions that served as part of their investigation into the assassination, and reproduced stills in their report of September 1964. The film itself was not broadcast until 1975. It is hard to credit that well into the 1970s the public did not view a moving image that, perhaps more than any other, came to define the turbulence of the 1960s. “The event was rare and strange. It was the screening of a bootleg copy of an eight-millimetre home movie that ran for twenty seconds. A little over twenty seconds probably. 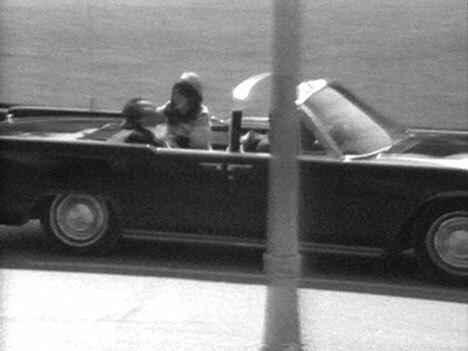 The footage was known as the Zapruder film and almost no one outside the government had seen it. Of course the event had a cachet, an edge of special intensity. But if those in attendance felt they were lucky to be here, they also knew a kind of floating fear, mercury reading out of the sixties, with a distinctly trippy edge. In this scene, Delillo combines multiple screens with the delay techniques of Dan Graham’s video pieces from around that time (techniques also used by Frank Gillette & Ira Schneider in their highly influential Wipe Cycle from 1969). It merges the use of video as radical software – [where] elements can be patched and re-configured in ways that were not possible with film – together with an understanding that television has been around long enough to be regarded as junk. All this is blended with the shock tactics of art-media groups from the early 70s such as Ant Farm, Radical Software, TVTV (Top Value Television). If the 8mm footage was created in the age of the news reel, it is mediated in the age of video, which operates under the economy of the feedback loop – to be re-recorded on to tape and repeated over and over again, to be set in the eternal frame, to cycle within the eternal return of ‘rolling news’. 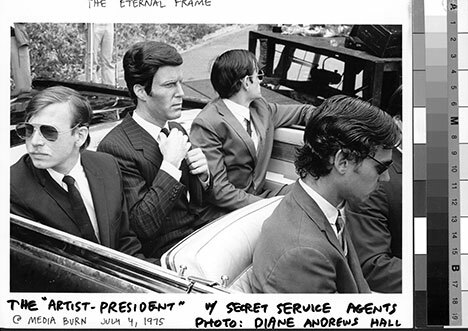 Ant Farm’s re-enactment of the Kennedy assassination, The Eternal Frame, was made the year that Zapruder’s footage became ‘publicly available’. Ant Farm’s copy of the film came from conspiracy theory sources and was originally bootlegged out of the Life Magazine lab. Ant Farm originally wanted to film early in the morning, to avoid the crowds, but it became evident to them that the light was not the same as the light on the Zapruder footage and they needed it to be as close to the ‘real thing’ as possible. Via the Warren Commission the Zapruder footage was already caught in a media feedback loop, forming a catalyst that generated the noise of speculation, folding back to create a conspiracy panic. Because it was not visible as a moving image for eleven years after the event, the footage had become the absent centre of the Kennedy assassination – 22 seconds of action stretching into eternity. The re-enactment served as a response to the belief that the Zapruder footage could somehow reveal something that had been hidden and repressed. But maybe the footage is replayed and re-enacted so often precisely because it fails to represent. A failure of representation is, in psychoanalytical terms, the central characteristic of trauma, but the re-enactment also fails to speak of something at the centre of the technology of non-scripted film – its promise to display evidence, its promise to carry the burden of proof. Four years after Ant Farm’s historic media interventions, Pope John Paul II staged his own media event when he visited Poland. The visit has been described by writers Daniel Dayan and Elihu Katz as a shamanised media event, which through its staging actually steered a course of events (the rise of the Solidarity movement and the eventual collapse of the Polish government). (2) The event was a ceremony, but a ceremony of a particular sort. Like the incantation of Weapons of Mass Destruction, through its performance it established the meaning of the event and institutionalised it in collective memory. It is at that moment of shamanistic feedback, when a new definition of what is possible is established, that the next step is urged forward. The media event can be seen as a form of consecration because it gathers into itself a series of values that feed back to form a narrative of a state of affairs that requires action. The ceremony of the countdown (which is itself a media invention, introduced in Fritz Lang’s Frau im Mond in 1929) begins the narrative that ends with the moon landing. This event – staged for television from countdown to touchdown – inscribes a series of values through its performance. It speaks of an era of positivist triumph, when American know-how knew how, and it represented the end of an era in which the vision of a murdered president was finally realised. It joins a string of images that are pre-scripted, including the 22 seconds of the Zapruder footage and the televised funeral of Kennedy, which folds back into itself to make a narrative of reality. The artist-president is the rhetorical shell of politics itself, his speech collapses past, future and present as the ghost of politics’ past reports on the significance of what is about to happen. Ant Farm’s media critique can be understood as a critical response to the promise of video, and perhaps more than any other artists they articulated its contradictions. In one respect, once released from the monopoly of the networks and accessed by ordinary citizens the Portapak video recorder and the video tape promised to be personally empowering and social: make your own social and technological networks, make and distribute your own programs, construct your own social software, democratise artistic practice. But the values of self-empowerment could easily be accommodated within a media feedback system in which our performance becomes not only a commodity that we sell to ourselves but also a means by which the media could narrativise and legitimise itself. As long ago as 1962, Daniel Boorstin coined the term ‘pseudo-event’ to describe events designed solely to be reported: presidential debates, press conferences (and media burns). (4) But perhaps Andy Warhol understood better than anyone else that the media event isn’t something you simply consume. Describing the unfolding hallucination of the factory, Warhol said, “They came to see who came”. (5) The people who come to see the party become the party, figure and ground become a single flowing image. In the same way the figure and ground of the press shift backwards and forwards, from the press as they arrive to report the event to the press as their bodies provide the props for the event. 1. Don Delillo, Underworld. New York: Scribner (1997), p. 488. 2. Daniel Dayan and Elihu Katz, Media Events: The Live Broadcasting of History. Harvard University Press (1994), p. 150. 3. Chip Lord quoted in Constance M. Lewallen and Steve Seid, Ant Farm 1968-1978. Berkeley, CA: University of California Press (2004), p. 73. 4. Daniel J. Boorstin, The Image: A Guide to Pseudo-events in America, originally published in1962. 5. Andy Warhol quoted in David Joselit, Feedback: Television Against Democracy. Cambridge, MA: The MIT Press (2007), p. 120.